Are you getting ready to buy a major appliance, like a refrigerator, oven, dishwasher or dryer? Get the specs. Ask your dealer for specifications from several manufacturers offering the type of appliance you need. Compare available features, designs and capacities. Know what you need now, and what you might need later. Decide which features you will really use, and what you might need down the line. Some appliances may include the option to add features later, like installing an icemaker in a refrigerator. Set your price range. Compare prices in relation to what the appliance offers—price tends to increase as features are added. Determine the size. Know what size and features you’ll need, so you can select a model with sufficient capacity. Check the space available to make sure your new appliance will fit, and make sure halls and doorways allow clearance for entry and installation. Consider the care. Ask your dealer for the appliance use and care manual. Read it carefully before you buy to get a better idea of the maintenance required. Find the fix. Make sure authorized factory service is available in your area for the brand you select. Check the power. Make sure your house has adequate electrical service for the appliance. Do some light reading. Read the warranty before finalizing your decision. Does the warranty cover the entire product? Only certain parts? Is labor included? How long does the warranty last? 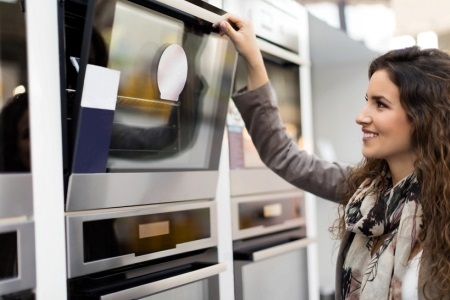 The number of options you have may seem overwhelming, but adhering to these tips from the AHAM will help you purchase an appliance you’ll love for years to come.